​this isn't your average weekend. run, walk, yoga...there's something for everyone! Kicking off on Friday June 7th, we will turn Blue Mountain pink as we celebrate International Rosé Day in style with a jam-packed weekend of pink drinks, good times and tons of fun. Over the course of the weekend, we will pay tribute to our favourite pink drink, while supporting a variety of very worthy causes. In 2019, the funds raised at the event will support The Blue Mountain Village Foundation, Casey House and The Period Purse; all Ontario-based charities working hard to support the people who need them most. 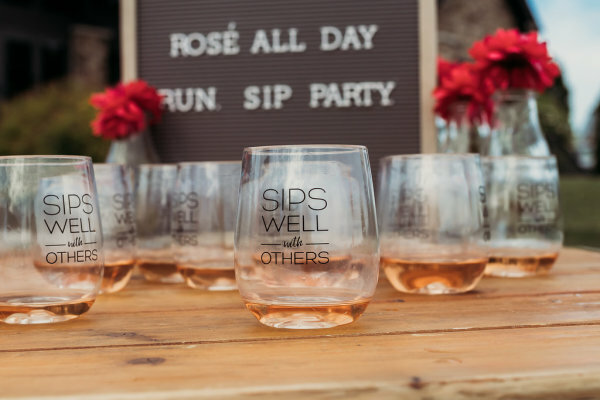 On Saturday June 8th, lace up your runners for a 5KM run/walk through the beauty of the Blue Mountains and then join us for the ultimate Après Rosé complete with food, friends, music and of course, rosé and other beverages! On Sunday June 9th, the fun continues with yoga on top of the mountain followed by a delicious all-you-can-eat brunch at The Blue Mountain Inn. Grab your mat for a Sunday Funday morning of yoga, relaxation, brunch and your favourite pink drink. Join us as we sip pink, wear pink and think pink in support of International Rosé Day this June! Whether you want to run, walk, yoga, party or do it all - we've got you covered. Looking to get the most bang for your buck? Sign up for "The Whole Weekend!" and let's toast to rosé all weekend long! Our early bird pricing will come to an end, so don't wait! The earlier you register, the more time you'll have to gather your friends, train those muscles and fundraise for our amazing charity partner. Wondering what's included in the price? This will depend on what you sign up for, so click here for more information on the different registration types and what's included. Is there anything better than running along the Blue Mountain trails, nibbling on yummy snacks and sipping drinks with your friends? Or taking some much needed "me" time with yoga at the top of the mountain and treating yourself to a scrumptious brunch? Yes! We believe there is - doing all of that AND raising money for a great cause. It's a chance to exercise your body muscles, your wine muscles and your fundraising muscles all at the same time! So lace up your runners, channel your inner yogi, grab your glass and let's do this. 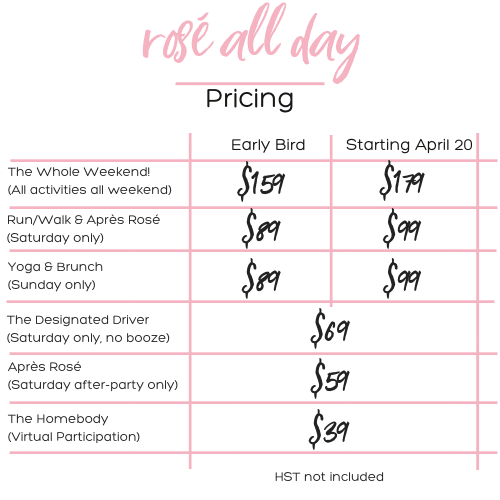 By the end of the weekend, we'll have you saying, "Yes Way Rosé!" ​While we love a full glass of wine, nothing fills us up more than helping non-profit organizations raise more money so they can change lives. 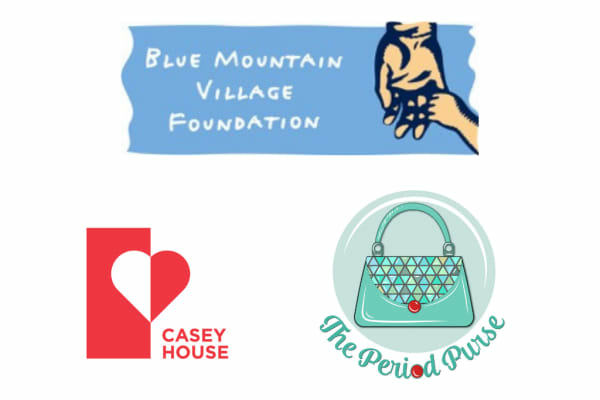 We are tickled pink to have partnered up with the Blue Mountain Village Foundation, Casey House and The Period Purse; all amazing Ontario-based charities that are doing unbelievable work to support the people who need them most. Together, let's raise a glass and lots of money for these deserving charities! Learn more about our amazing charity partners.